We finished our second production of purse and camera straps in Lombok, East Nusa Tenggara (part of the Flores islands) and a month later a series of massive earthquake hit the islands hard. A magnitude of 7.0, this natural disaster killed more than 450 people and left many wounded and homeless. It shocked me, it shocked everybody in the island and everybody who loves this gorgeous island. I am always by nature, hopeful. I continue to believe that we are stronger together and must work as a community to lift up each other. So I texted all of the project managers to see if everyone, the artisans and their families are okay. Thank God, they were all safe. Many of them had to sleep on the streets fearing the aftermath of these earthquakes, but they were all okay. Fast forward to today, everyone is rebuilding, everyone wants to start working again. Check out the beautiful pieces of straps made out of ikat. They are all handmade, hand weaved and created beautifully using skills passed on for many generations in the island. 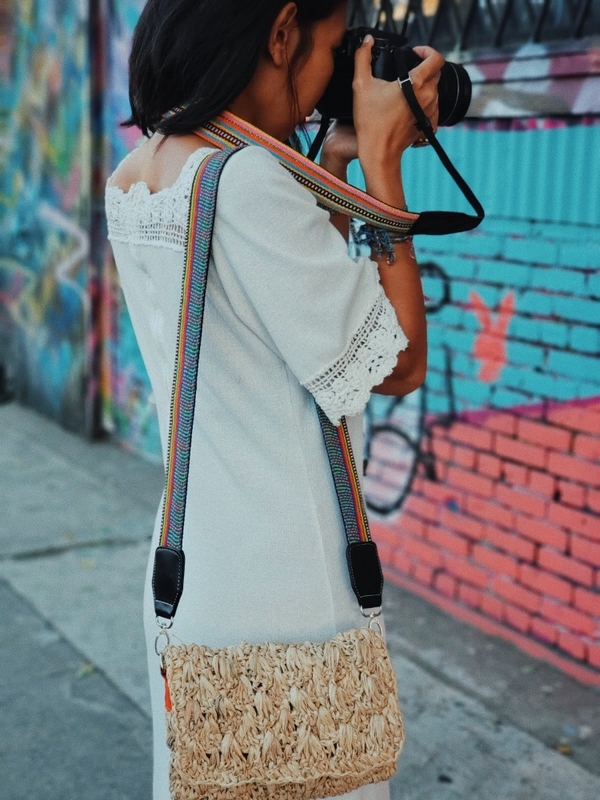 Whenever we sell a piece of camera or purse strap, a chunk of profit goes to benefits Education and Healthcare funds for the artisans and their families. By supporting us, you are also providing jobs for the communities in Lombok, which is key to the success of rebuilding of this island. “It must be stressed that the majority of the damage is located in North Lombok and that other areas of the island remain largely unaffected. So PLEASE, come and visit Lombok again. We are putting together a tour to visit our artisans and their villages soon. You should come! Here in Los Angeles, Toko-Toko continues to do our part to help when we can. We opened our booth at events and connect to collaborate with communities and fellow fashion activists. We will be at Abbot Kinney Festival on Sunday, Sept. 30th, a soon to be announced “Indonesian Night” event in Venice in late October and Fair Trade Fashion Show Fundraising in DTLA. On top of that we have creative collaborations to aggressively fundraise to benefit our artisans in Lombok. Connect with me, with my community. If you’re interested in joining us next year to visit Lombok, Bali and Jogjakarta for a yoga retreat, cooking lessons and to visit our artisans then PLEASE let’s chat! The one sure way we rebuild is by having you come to visit the gorgeous islands, swim in our ocean and spend the nights on our beaches.. you’ll fall in love and we will be extremely grateful. A Campaign. Dedicated for the Strays of Jakarta. Melissa Sunjaya of Tulisan came to Los Angeles for a few weeks in the Summer. With her presence, she spreads magical creative dust around. I am forever convinced that being around Melissa is like being around an unexplainable tunnel to another dimension. A world so beyond the imagination of our galaxy, which somehow found a perfect door to attach itself to Melissa. And lucky us, we get to see snippets of wonderful things in this other world through her art. After she left I continued to bath in this joyous feeling of laughter, of creativity, of a different set of perspectives in seeing the world and problems in it. I strangely felt free from restrictions. I contacted Niza Dafney, a photographer I've been wanting to collaborate with, another Indonesian-American creative in Los Angeles. She and I had briefly chatted on Instagram and casually mentioned we should collaborate, yet haven't had a chance to do it. This time around both our schedules work, FD Photo Studio has one spot available, it was the world aligning itself to allow for more magic. Tulisan Pouches, Cubes. Illustration on Journal and Cup also by Melissa Sunjaya. It was the first day of Spring in Los Angeles. But you Angelinos know how winter came late to the city this year, so that morning of the photoshoot we had a somewhat chilly morning and grey-ish weather. I looked outside of my home studio window and decided that we are going to infuse happiness and a whole lot of happy colors into today's work. Did you know that Melissa is a dog lover? In August 2017 when I went to Jakarta, she just adopted her first dog. From then on, Melissa had adopted two more dogs from a local shelter. Being magical Melissa, I truly believe that now she speaks dogs fluently. She became in such a short period, a dog whisperer, a dog holistic-healer. I am truly honored that she sees me as being in a pack with her, though we're two continents apart, from one dog lover to another we bond furthermore over concerns of stray dogs and cats in Jakarta. Before she left she gave me her gorgeous ilustration work on journals and set of cups so we can fundraise together, "for the strays" she said, "yes, for them" I nodded in agreement. So here we are, Toko-Toko is rolling out our first campaign for animals. The merchandise you see on this blog will be available soon for you to purchase. These Tulisan items are no longer available in stores, they have been safely kept at Blue Lounge studio in Pasadena. The same as the journals and the beautiful coffee cups. A date will be set soon for our campaign. Until then you should continue to check our Instagram daily for the announcement. I'm excited for these beauties to help the lives of many strays in Jakarta. Melissa will pick out the shelter or non-profit to donate fund from the sales. As for me, I will continue to write my love letters of Sustainable Fashion and spread more love, light, and kindness in this industry I love. While we were at Coffeehall Chinatown for a pop-up during Chinatown Summer Night 2017, we met with the awesome crew of Chinatown Business Improvement District. A few emails later, they offered us to take part in the next Moon Festival event. We quickly said yes and saw this as an opportunity to share our Javanese-Indonesian culture with our community in China town. We contacted our good friends at the Indonesian Trade Promotion Center (ITPC-LA) and our talented and fellow creative friend Sultan Agung to help us put together a Shibori Batik Workshop. After a discussion with Agung, we decided to use a canvas tote bag as the media for people to do batik. This will also allow them to bring home an item that is useful and can be used to replace plastic bags. Sounds like a win-win to us! We set up an email sign up a few weeks prior to the event and had 25 people signed up about a week prior to the workshop. We prepared more totes, just in case we had more people attending. And guess what, a day before the event we had 40 people, on the day of we actually had more than 50 attending! Yikes and yayyy at the same time! What is Batik? Wikipedia explains it as a technique of wax-resist dyeing applied to a cloth. This technique is an ancient skill passed on for generations in the Javanese culture of Indonesia. While this technique is also known in other parts of the world, UNESCO in 2009 designated Indonesian batik as a Masterpiece of the Oral and Intangible Heritage of Humanity. A note on Agung, his father is a master gamelan and Javanese culture here in Los Angeles. His father used to work with my grandmother in Yogyakarta, Central Java, to preserve our traditional Javanese culture. While we're offering more of a modernised-fusion version of batik here in LA, it still truly is an honor and privilege for me to be able to continue the work of our ancestors in Jogya here with Agung. All the the materials are laid out for shibori batik workshop. Pic by Sultan Agung. Back to our evening of batik workshop, once people started coming, we quickly realized that we ran out of tote bags. And this is where community surprised us, someone asked if it's okay if they gave out old clothing and fabric they had with them in their car. Agung and his assistant Grace said "Yes! ", and so began the most loving, most caring with a flair for sharing Batik workshop in Chinatown. The evening was fun and informative. People sampled free Indonesian snacks provided by ITPC-LA while they waited for their totes to dry. It was great to meet people who are interested in learning more about our culture, and actually enjoyed the meticulous steps of getting it right. We also loved all the creative designs people came up with! We want to thank Chinatown Business Improvement District, the Indonesian Trade Promotion Center - Los Angeles, Sultan Agung and Grace and everyone who attended our workshop. We are rolling out more workshops in the Summer, to book a workshop please send us an email to admin@tokotoko.us . Let us know how many people in the session. Look forward to connecting with you! This is Lolo, so good to be able to blog again after a long hiatus! You probably didn't realize but Toko-Toko actually took a long break from May to August this year as I figured out the vision and mission of our company. This past year my husband and I have taken time to go outdoors and connect with nature. We've gone on camping and backpacking trips, and I'm a changed person because of the raw beauty I've witnessed. I started to feel that the right thing to do for us is to be kind to our environment by being sustainable. Around July I took my daughter for a month trip to Indonesia. We spent the first week in Jakarta with my parents. With my dad's suggestion I started doing daily meditation again, after a few days I was very clear on what I need to do for Toko-Toko. We need to carry only brands that are sustainable and fair trade. We also need to create our own brand, work with local artisans and make sure they get paid their fair wages. I reached out to Ursula Tumiwa, the designer and owner of 'Indonesia Loh', explained to her what I wanted to do, sent her very rough sketches of items I would like to make. Ula as everybody calls her, is an amazing person with her own community and film projects. She quickly helped me connect with a team of artisans in Kulon Progo village, Jogjakarta. I booked three train tickets for myself, my daughter and Ula and head out to Central Java to my father's home town: Yogyakarta, Indonesia. Train ride was about 8 hours, we left Jakarta around 7am and arrived in Yogyakarta around 3pm. Our family's home is located close to the Sultan's palace and is now turned into a beautiful guest house run by my uncle and his staff, you should check out Ndalem Maharani ('Maharani's House') if you plan to go to Yogya! We rested for a night and the next day a team of us, a camera man and a husband and wife team of photographers I just met head out to Kulon Progo to meet with the artisans and film their work. When we were there I was really amazed by the warmth and openness of these women. They laughed and shared their stories with me. They told me that the younger generation is not interested in learning this traditional weaving craft because it pays less than working at factories in their village. Women artisans make less than $1 a day. Local factories pay their workers about $2 per day, naturally the younger generation feels that being an artisan is a job for older married women without any skill. It's no longer seen as pride of a culture, but merely a job that pays very little. This information saddened me. Weaving is a craft that has been passed on for many generations in Jogjakarta and Central Java. If the younger generation is not interested and feel ashamed of doing this beautiful work, then a tradition and a culture of hundreds of years will die. I also learned that their work are being sent to Bali and Jakarta to be sold every where from street vendors to local shops and hip boutique hotels. From here these beautiful items are purchased by international buyers and being sold to customers for even higher prices. At this rate everybody else makes high profit, except for the actual people who make them. Working directly with artisans allows me to cut down middle men so both makers and customers receive better prices for them. By the time I got back to Jakarta, some of the samples we made were ready to be shipped to Los Angeles. I sat and thought of a name and decided to use a name lovingly given by my good friend Irma years ago in Los Angeles for me and Caitlin "Martini and Milk". I was a single parent for four years, and til today I pay for my daughter's education on my own. As a mother I would do everything to provide the best for my child, just as these women artisans do in their daily lives. It seems very fitting that together as women we work together for a better future for all of us as a community and for the future of our daughters. Since we came back to LA we've rolled out amazing collaborations with awesome creatives. We now work from a new space in Chinatown and will continue on to have pop-ups around Los Angeles. I want to personally thank you for the support you've shown me and the artisans so far, I'm so grateful for each one of you. Please continue on to check our Instagram for next events, pop-ups, collaborations etc. Much love from our Chinatown Los Angeles working space to your homes and work spaces. Til next blog! At the end of Fall, my buddy Jei from Wanderlust Creatives sent a quick text, "Hey, down for a photo shoot sometime next week?" I didn't even look at my calendar, I just said "Sure, what are we doing?" He said swimwear, we'll be working with Sieva swimwear and the talented Hair & Make Up Artist Beauty by Bonbon. I was stoked. Here's the thing with running your own business. A lot of time I actually don't get to do anything creative. When I started Toko-Toko I thought I'd be using my time blogging, styling and doing pop-up talking to people and selling. I had a partial picture of what it was like being a business owner. I quickly realized of course that apparently most of my time is spent on contracts, shipping, dealing with bookkeeping and other paper work that are time consuming but must be dealt with. With all that paperwork, it's hard to get creative. These days I realize that one thing is a must: I need to make time for creative projects. And I'm SO glad I did! The photo shoot was incredibly fun. The models Julia and Kristina were such brave souls, dipping in to the pool in that 64 degrees weather. Wow! You gals rock! I'll post pics of the photoshoot soon. It was such a great collaboration, I'm pleased with how the results came out. I'll be posting pictures soon, I hope you guys enjoy them as well. Some of those pics are up on Toko-Toko's Instagram, feel free to check them out. We love to connect. We love to see you in person, laugh with you, getting to know you better and understanding how we can serve you better! It's a joy for us to see our old friends and gain new friends each time we do a pop-up. So, it only made sense that the weekend right before Valentine's day we collaborated with our good friends the Wanderlust Creatives to do a mini pop-up, a celebration of love, at our favorite place in Old Town Pasadena, Cafe 86. The event turned out as exactly how we envisioned it to be: an intimate gathering of friends old and new, with everyone listening to music, purchasing one of a kind artisan pieces, enjoying yummy beverages and pastries while having their portraits taken. We love all the couples, families, friends, cousins coming together that beautiful Sunday afternoon! Thank you again to everyone who came out to support. It really was such a heart-warming event, we didn't think so many of you would be there.. it was such a pleasant surprise for us :) A proceed of your purchase that day as promised will go to help feed the hungry in rural America through Feeding America. There are a ton more pics from the pop-up. If you're interested in purchasing yours, please contact the Wanderlust Creatives at info@wanderlustcreatives.com they'll give you details to get your photos. Til next pop-up! We love being Indonesian diasporas in the U.S. Our communities are so diverse and spread from one coast to another, and we love the spirit of "unity in diversity" which allows us to work together in many different events and occasions. Naturally when the Indonesian Consulate in New York invited us to join their "Indonesian Street Festival" event, we jumped right in to the opportunity to meet our community there and introduce gorgeous artisan Indonesian brands to local New York market. Upper East Side here we come! Thank you to the Indonesian Consulate of New York for putting together such an amazing event. We're so touched and proud to see booths of our beautiful cuisines and beverages, a learning how to speak Indonesian booth and other Indonesian-American businesses that were there with us to sell Made in Indonesia products. We are also grateful for those who came to eat, shop and support the Indonesian Street Festival! We're also stoked that during the trip we got to have a meeting with the power babes of Shop Mahisi and Ornate Reverie . Look for our future collaborations on Pop-Ups and Sample Sale with these babes! Toko-Toko turned 1 year old on August 23rd, 2016. At the same time we celebrated the launch of our favorite brand from Indonesia Tulisan created by Founder and Designer Melissa Sunjaya. Tulisan is a collection of handmade, limited-edition illustrated prints that are applied to bags, totes and household accessories. Each illustrated edition is based on a story reflecting varying themes of the heart and is complemented by color palettes that are hand-selected to illuminate each soulful narrative. With the Director of Indonesian Trade Promotion Center, the President of ASEAN Women Circle of Los Angeles Mrs. Nila Umar Hadi and the Consul General of the Republic Indonesia in Los Angeles The Honorable Mr. Umar Hadi. Thank you team Tulisan Jakarta and Founder and Designer of Tulisan, Melissa Sunjaya, for this video message an explanation of the brand Tulisan, a short history and a congratulations to our first anniversary. We thanked the Indonesian Trade Promotion Center, the Director Mr. Adrian Lubis and his staff for opening their showroom allowing our team to completely convert this space into a heavily Toko-Toko vibe with a brand focus on Tulisan and its products. Thank you to the Indonesian Consulate, the Consulate General of the Republic of Indonesia, The Honorable Mr. Umar Hadi and the President of ASEAN Women Circle of Los Angeles Mrs. Umar Hadi for the warm and encouraging Opening Remarks. Thank you to our friends and families, our Indonesian diaspora community and our local Los Angeles community for your love and support. 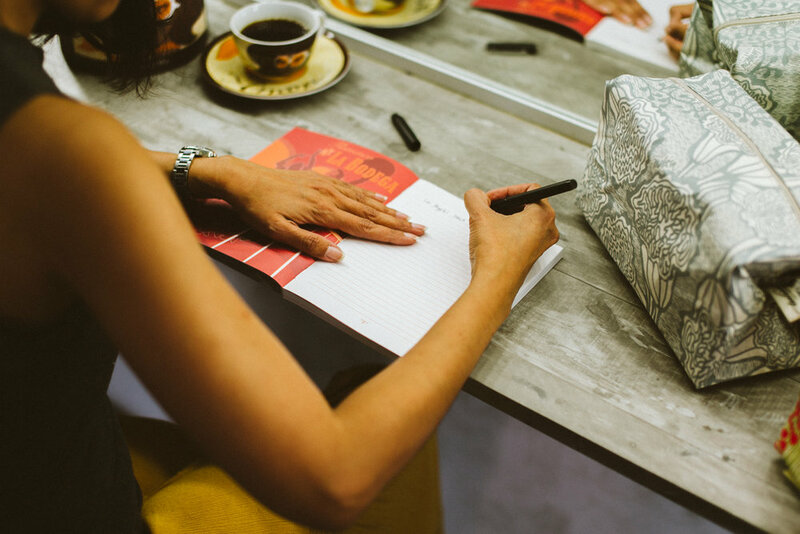 Lastly, thank you to our friend Jei Romanes of the Wanderlust Creatives for the gorgeous photos you took during our event. Thank you for your endless support, the beautiful and elegant Mrs. Nila Umar Hadi, the President of ASEAN Women Circle of Los Angeles. It's always heart-warming to us to have our young Indonesian diaspora supporting and loving our events and products. A modern Indonesian brand to be proud of. Indonesian food is influenced by many cultures such as Chinese, Dutch and Indian influences. Creating the most delicious, bold in colors and in taste pastries and beautiful dishes. A big part of our mission is to introduce and assist brands to enter the U.S market. We thank our creative Downtown LA Arts District community for such warm welcome to Toko-Toko and the brands and designers it represents. Love you team Wanderlust Creatives! The first photography team to believe in Toko-Toko wholeheartedly when we had our first photoshoot a year ago. Thank you for friendship and love! We went straight to New York city to join the New York Indonesian Consulate's Street Festival. More in the blogs to come. More events and pop-ups are in the work, we're currently taking a much needed Labor day weekend off. Keep following us on Instagram at @popup_tokotoko , until next event! We're on serious pop-up mode until end of the year. Sure, social media is great, but it cannot replace the direct connection and energy we feel when we meet with you, talk and laugh with you at a pop-up. We get our best ideas from talking and listening to you, your wants and needs, and how we can serve you better. We don't take our communities for granted. We said it over and over again, Toko-Toko is a bridge between the communities. When we listen to each other and try to understand the needs, that's when communication starts, trade happens, we fill in gaps that exist in our communities and start to benefit each other in very major ways. This is key to us: to listen and to understand so we can understand and deliver. We want to thank everyone who shopped our last two Pop-Ups (Sample Sale & Indonesia's Independence Day), we also would like to thank all the brands that participated at our Pop-Up Sample Sale. Thank you City Plants for all the beautiful trees for Tree Adoption Day! And thank you to those who came to adopt these beautiful trees. Our hearts are full with love, and we thank you. In a true spirit that is uniquely and warmly Indonesian, we ate, drank, laughed, and hung out with our Indonesian community during Indonesian Independence Day celebration at the Indonesian Consulate on Wilshire last Sunday, August 14th. Thanks for shopping our booth! And the super awesome day with these fellow vendors and the organizers of this event! Terima kasih (Thank you) Mrs. Nila Umar Hadi, the President of Southeast Asian Women Association for shopping at Toko-Toko booth, and everyone who shopped with us! As always, we love you and we thank you. We're getting ready for New York and also for private pop-up sample sale coming up soon. Stay tuned, we look forward to seeing you again at our next event! We are so very stoked! Our next Pop-Up Sample Sale is coming up very soon this Saturday, 11am-6pm, in the heart of the Arts District of Downtown LA at 1904 7th PL, LA, CA 90021. The pop-up features lifestyle and fashion brands, two food trucks (@bigbalitruck & @sonofabun), collaborating bloggers-influencers (@barbiebeth & @amalienywichmann), & a lounge featuring free coffee and Indonesian snacks. We are collaborating with the City of Los Angeles City Plants in this event and will be hosting a 'Tree Adoption Day'! Racked LA suggests some serious karma points at the Pop-Up from adopting a tree or making a purchase which helps benefit 'Water is Life' program, providing clean running water for the people in Ngimbang village, East Java, Indonesia. DTLA Babes with Pop-Up Flyers! Hope to see you at the Pop-Up! We had our Summer Kick Off Mini Pop-Up on June 24th, a collaboration with The Unusual Blog & Cafe 86. It was such a charming and low-key location atCafe 86 in their Mills Alley, Old Town Pasadena location. We had the beautiful Anastasia Lynne sang beautiful tunes throughout the evening. It was a heart-warming shopping event, sample sale and fund-raising evening. Our heartfelt thanks to our communities, to everyone who came and shopped with us. Thank you for shopping small businesses, and helping us fund raised for our 'Water is Life' charity. Thank you Anak Los Angeles and Milco Sutrisno for your support and photography posted on your accounts of our mini pop-up. Thank you Indonesian Women Alliance (IWA) for supporting our event as well. When communities get together for a cause, the world smiles and shines a little bit bigger and brighter. Thank you Brijit, first babe to shop at our mini pop-up! Toko-Toko partners with Anastasia Lynne, thank you for your beautiful voice & presence! Thank you from team Toko-Toko & The Unusual Blog babes, thanks for sharing the evening with us, thanks for raising fund for 'Water is Life' charity! We recently received an update on the donation sent to Ngimbang village in East Java, Indonesia, for clean water project. Toko-Toko's donation through your purchase has enabled the local non-profit in Indonesia to install four sinks in local schools. This allows for prevention of diseases that can easily spread among children by a simple act of hand-washing prior to meals. Thank you again for your continued support, please continue to shop with us, come to our events and simply spread the words about Toko-Toko to your friends! See you online on Instagram @popup_tokotoko and @tokotoko_us and on our pop-up events! When we started Toko-Toko, we instantly knew that it needs to function as a bridge between all of our communities. As Asian-Americans with Indonesian heritage living in Los Angeles, we are so fortunate to see and experience the best of creative work in the U.S. and in Southeast Asia. After all, when you get to call Los Angeles and Bali 'home' at the same breath, you cannot deny that you are blessed in every sense of each letter in the word! With this blessing we see a responsibility as well to help the less fortunate in the communities. Though cliche, we truly believe in making the world a better place for all when we can. Therefore, we set aside part of our profit to assist a community project of our choice. Since August 2015 we work closely with a local non-profit in Ngimbang village, East Java, Indonesia to provide clean water for this dry village. Providing clean water to the front of each home. The pipes are installed in front of their homes to allow for easier water access points in the village. They still have to fill out buckets and bring them inside the houses, but now the women and children will no longer be walking miles to the next village to haul water. The fund Toko-Toko raised recently was formally received by the workers of the non-profit and the Head of Ngimbang village. Half of the fund received will be used to build four sinks in local school in April this year. This allows prevention of diseases that can easily be prevented by an act as simple as washing hands. The rest of the fund will be used for monthly expenses occur to maintain these pipes and technology. We received a 'Terima Kasih' (Thank You) note from the non-profit and the head of the village. But truly, this is a Terima Kasih to you, for shopping at Toko-Toko, for supporting our pop-up. Your gorgeous fashionable hearts have assisted the people of Ngimbang village to have running water. You are looking chic and helping the children in the village have running water at homes and at school. We love you, yes you, pretty little thing reading this blog. Toko-Toko had our second Pop-Up in DTLA, Arts District, on December 5th & 6th, 2015. We partnered with Dietch PR for the event. 24 total brands were there, top U.S. bloggers Dani Thorne, Danielle Victoria, Ellen V Lora & Linn Nguyen in their booths, two amazing food trucks Komodo & The Lobos Truck plus Stumptown Coffee who sent us their fabulous coffee to get us awesomely caffeinated throughout the two days! We love the fashion babes, the boyfriends-husbands-partners, more bloggers, the coolest of moms who brought their cute teens to hug their favorite bloggers at the pop-up. We wanted to hug you all. Yes, every single one of you who made our heart sang with your support for the pop-up. Except that we knew that would probably freaked you out, so we held back and greeted you with a super happy “HELLO!” instead. Enjoy the photos, there’s more pics for you to enjoy on our Instagram account (tokotoko_us & popup_tokotoko) & Facebook page. Stay tuned, we’re cooking up our next pop up in another awesome space. DTLA Arts District Pop Up Launch Party! We did it. We had our launch party! From the bottom of my Indonesian-American heart I am absolutely thankful and appreciate every single one of you who came to, shopped and supported us. To me, when communities meet and gather, wonderful things happened, doors of opportunities open up, trade happens, wealth is shared and distributed in a fun and beneficial way! A lot of good things come out of it. For Toko-Toko especially, we are grateful that our business allows us to donate 10% of our profit to help purchase, install and maintain pipes that bring in clean water to Ngimbang village in East Java, Indonesia. Pic from the Arts District Co-Op Instagram account. I had a whole lot of soul searching before I started Toko-Toko. There is always in me a wish to help my communities. I'm by any means not the smartest, the bravest, the strongest, but I often feel very blessed and fortunate to have what I have. I always think that we each can help a little bit so the world can be a more beautiful place for others too. Toko-Toko allows me just that. The Pop-Up needs to benefit my local LA community & my Southeast Asian community, I was glad to see the other vendors too benefit from the support my awesome Indo-LA community brought on. I was glad to see people purchase our limited edition merchandise because that means there are jobs in Indonesia that will be sustained. I am extremely humbled to think that everyone helped guaranteed clean water will continue to run in Ngimbang Village, across the world from where you and I are sitting down today. I'd like to thank the awesome crew of the Indonesian Trade Promotion Center (ITPC) - Los Angeles for their amazing support. They provided beautiful Moscatel wine provided by a winery in Bali (soon to be available in U.S. market), snacks by Deka, pins of Indonesian American flags and of course their tote bag. Thank you again for your support, we're excited to continue our journey and feature talented designers of Southeast Asian heritage, bringing in limited edition & artisanal merchandise to you. Most of all we will always have a charity or non-profit to partner with, what is life for when we can't help others? Please continue to shop with us online while we cook out another plan to present another awesome pop up your way & feature more designers! I have been following Alex(a)lexa for years now. They really are an awesome team, the designer Monique Natalia Soeriaatmadja & her husband and business partner Sendy Soeriaatmadja. Confession: they are also dear friends of mine. I love Monique's sense of style from her days as a student in London. When she finally started designing ready wear collection, I am finding myself loving her urban sense with a quirky twist and I started tocollect gorgeous Alex(a)lexa's pieces. I think it's only appropriate that they tell you themselves of the who, what and why behind this awesome brand. Toko-Toko carries their water collection on our shop!